Caracas is the capital and largest city of Venezuela. The South American city is one of the few that combine excellent conditions for mountain and beach tourism. Among the sights of the town is the square of Bolivar. The area was once the center of the Venezuelan capital. According to local beliefs, this is the place where Diego de Losada founded the city in 1567. In the park is located the monument of Simon Bolivar - a revered Latin American independence fighter. In Bolivar Square rises The Catedral Metropolitana de Caraca. The temple is architecturally modest in comparison to the other churches in the country, yet its interior is richly decorated, placing a major emphasis on detail. The cathedral was erected in this place shortly after the creation of the city. In 1661, however, an earthquake destroys the old building and in its place today is a beautiful cathedral. On Bolivar Square is another memorable place, extremely honoured by South Americans. It's Casa Natal El Libertador – the house of Simon Bolivar. Near it is the place where he was captured. San Francisco Church and the Cathedral Caracas also deserve special attention. In Caracas is located the largest mosque in Latin America. The construction of the temple began in 1989 at the initiative of Sheikh Ibrahim Bin Abdulaziz, after whom the mosque is named. The minaret of the Muslim holy site is 113 meters high, the dome is also impressive. The building can hold more than 3, 500 pilgrims. Among the collection of historically significant buildings in Caracas are La Casa Amarilla - a former prison that is now used for the building of the Foreign Ministry of Venezuela, El Capitolio Nacional - the seat of the legislature, the National Theatre, the Basilica of Santa Teresa, St. Peter's ChurchEl Palacio de Miraflores, and Museo Arturo Michelena. El Panteón Nacional is among the most visited places in the capital. It is located five blocks from the square in Bolivar, at the northern end of the old town. Once a majestic church, in 1874 the building was given another important purpose - to be the last home of renowned Venezuelan people. El Parque Central in Caracas is a place that represents the modern face of the city. 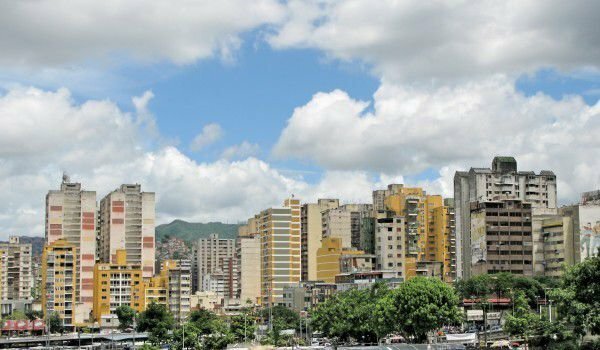 Here are the twin towers - the tallest buildings in Venezuela, which over the years have become a sort of "icons" for local architecture. In the center there are many business and administrative buildings. There are also many seats of cultural institutions. Complejo Cultural Teresa Carreño is where guests and resident can enjoy the Venezuelan Performing and Applied Arts. 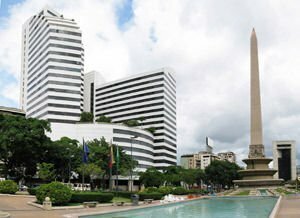 Boulevard Sabana Grande also attracts many people, especially with the abundance of shops, restaurants and the like, located all around it. Las Mercedes district is where the nightlife is concentrated in Caracas; it is more distinct as the fashion center of the Venezuelan capital. The place attracts entertainment of any kind - within the neighbourhood are many restaurants, bars, pubs, art galleries and swimming pools. Among the places that must be visited are Plaza Venezuela are the Parliament, the Paseo de los Próceres, Plaza Francia, Palace of the Academies and the Arco de la Federación. Caracas is located 800 meters above sea level. The charm of the city comes from the marvellous composition of the Venezuelan coastal mountain range, which surrounds the city. It is the main culprit for the nice cool weather and beautiful landscapes - a combination between nature and urban environment. On the outskirts of town is the Botanical Garden of the Venezuelan capital, the park of fountains and the beautiful East Park. Venezuela's capital has a population about 4 million people. Carcass is the most populated city in the South American country. Near Caracas, 60 miles west, is a picturesque German village, very visited by tourists. The settlement is called Colonia Tovar. Here over a century ago settled a large German community. The place is very interesting, because it carries visitors into a completely different world of German customs, traditions and architecture. The village for many years was inviolable territory, which is why locals preserved their dialect, original dishes, costumes and dances.